Since the official launch of the MakerDAO Korean community in November 2018, a number of notable projects and companies have signed on to support the Dai ecosystem. Integrations by VANTA, Coinduck, and Metaps are all examples of how leading organizations are fostering the Dai ecosystem in Korea. VANTA accepted Dai for its presale, and is planning to bring Dai into its ecosystem. Coinduck, which is the most popular Korean fiat-crypto application, integrated Dai — making it accessible by more than 1000 partner stores and 13,000+ KYC confirmed users in Korea. Metaps accepted Dai for its gift card sale, which sold out within a few minutes. 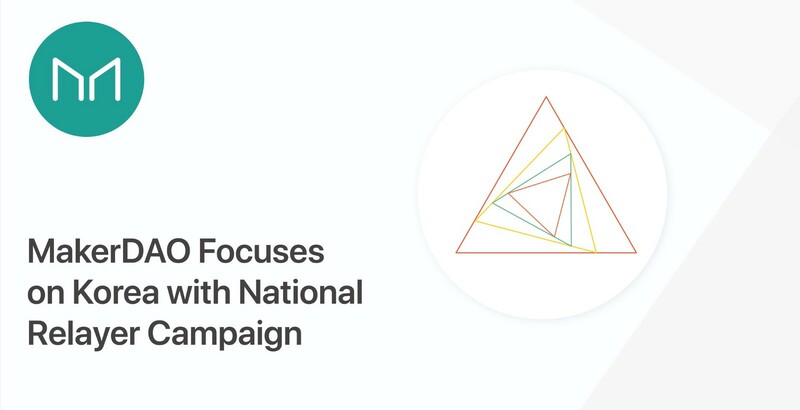 To build on the strong support for Dai in Korea, the National Relayer campaign in Korea is launching soon. The campaign is a community-driven effort that involves twelve Relayers that consist of Korean cryptocurrency exchanges, incubators, and VCs. These Relayers will introduce Korean projects that are in the early investment stage to Maker for integration. They will also promote Dai usage in various ways, including encouraging their associated projects to fundraise and integrate Dai in their dapps. Many Relayers are already taking steps to help the Dai ecosystem, and we’re excited to see them building strong use cases from Korea! Blockwater Management is a leading digital asset investment and advisory firm based out of Korea. We actively invest and advise projects focused on bringing blockchain enabled projects to real world applications. Block Patch is a blockchain consulting and incubator firm. We support project building, marketing, and event organizing to make a better blockchain ecosystem. CGEX is a global crypto-to-crypto exchange launched by Coinone, one of the largest cryptocurrency exchanges in Korea. Specifically designed for savvy investors, CGEX envisions ‘Innovation Beyond Finance’ to become a highly secure and convenient platform that provides institution-grade services. FoundationX is a blockchain accelerator, building a blockchain business ecosystem. We are united under a single purpose of innovating and transforming technology to deliver more exciting, interactive and decentralized future. GOPAX is a tech-oriented cryptocurrency exchange. It is a forerunner in cryptocurrency exchange operating standards, being the first exchange in the world to acquire ISO 27001 and ISMS security certification. GOPAX continues to contribute to the healthy development of the blockchain ecosystem. Hexlant is a laboratory specialized in blockchain security and blockchain technology development. Hexlant provides smart contract audit and cryptocurrency wallet technical supports by working with major blockchain foundations and exchanges. Hexlant research team publishes top class research papers on blockchain technology and industry. Hillstone Partners is a company founded by executives of Korea’s first M&A company, and is carrying out a business strategy that focuses on development of a platform that supports not only funds but also other PE funds and combinations based on its overseas blockchain network. NEOPLY, a Seoul-based startup accelerator, is focused on investing in early-stage startups. We provide mentoring, angel-funding and workspace for startups. We have invested in more than 42 startups since 2008. RocketFuel is a global VC that focuses on enriching innovative industries. SEED VC is a startup accelerator. We provide investment and community service for blockchain projects. Upside / Metaps: A group of blockchain fintech companies operating across Korea and Japan, connection the gap between the cryptocurrency and the commerce network world. Key businesses: UPXIDE(exchange),CryptoCard(cryptocurrency coupons),and SmartPlus (payment). WelcomeDecent is a blockchain expert group providing a diverse range of blockchain-related services including ICO consulting, accelerating, incubating, fund raising, marketing and CS.